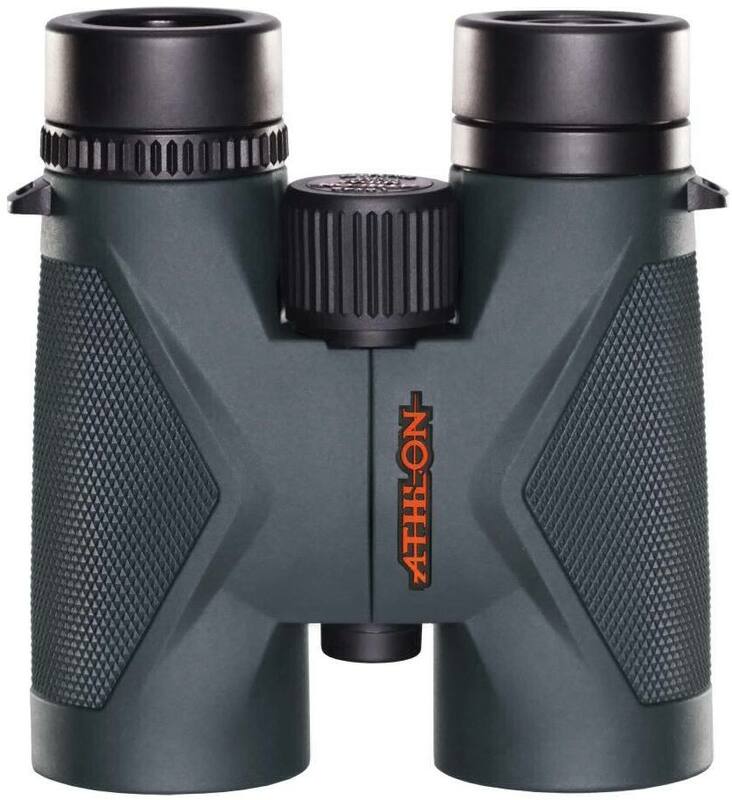 Proudly American, Athlon optics main stated aim is to deliver higher-grade sports optics and accessories for the outdoor market. 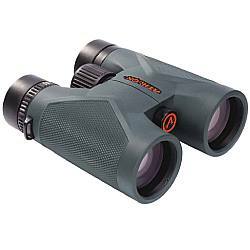 These products include Binoculars, as well as Spotting Scopes, Riflescopes, Red Dot Sights, Rangefinders and related accessories like tripods, binocular tripod adapters and a binocular harness. 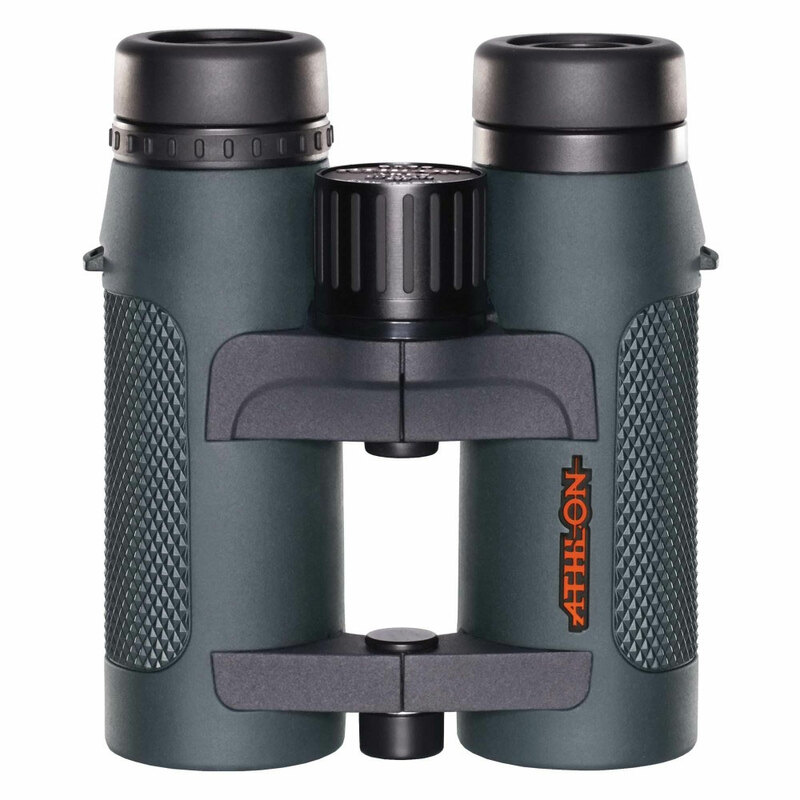 Athlon Optics say that they are able to offer their products at very competitive prices because of their close connections with "quality manufacturers" and a "streamlined fully integrated supply chain". It is in this way that they are not only able to keep manufacturing costs to a minimum, but also remove some layers associated with a more traditional supply chain. Athlon also state that one of their main strengths is in engineering design and that they work very closely with their manufacturing partners using only the highest level of precision CNC machines, superior lens polishing and advanced equipment for optical coating. The great looking Cronus series is Athlon's very high end offering and indeed is at the moment, the flagship series within their range. Only produced with 42mm objectives, they currently offer either a 8.5x or 10x option. Field flattener lenses which Athlon call their E2ES lens system. 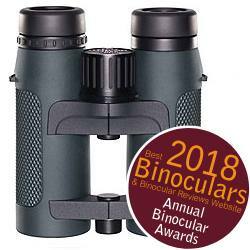 These are designed to correct field curvature and thus ensure that the view remains sharp from the center right to the edges and is a definite step-up from many optics out there. ED (extra-low dispersion glass) elements in their lenses that are designed to reduce chromatic fringing. Dielectric Prism Coatings - increased brightness and image quality as these very special coatings are able to reflect more than 99% of the light that hits them. 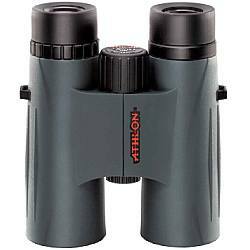 Note Athlon call this their ESP Dielectric Coating, but you can find them on other very high end optics. The Prisms are also made from Bak-4 glass and are phase corrected. 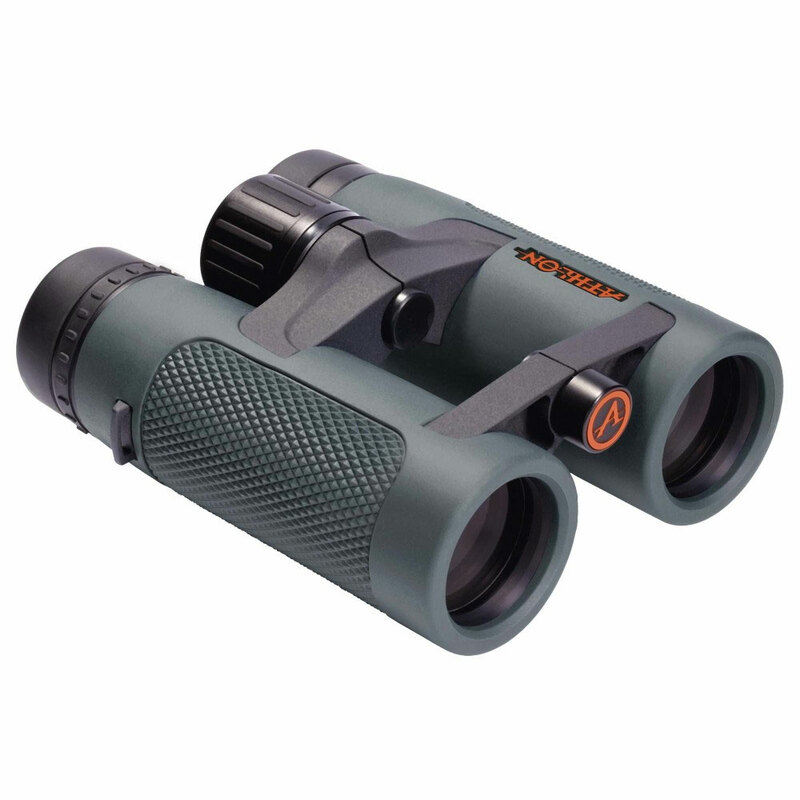 These fantastic quality optics are protected in a Magnesium chassis, that is both water and fogproof and with small upgrades like a lockable diopter ring, shows a great attention to detail. 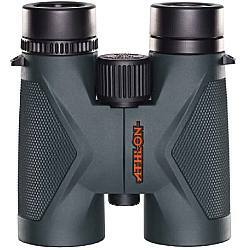 10x42 338ft 19.3mm 6.6ft 33oz 6.3 x 5.1"
8.5x42 399ft 19.3mm 6.6ft 33oz 6.3 x 5.1"
Sitting just under the headlining Cronus series, is the Athlon Ares series of binoculars that still offer an incredible performance with almost all the same features (apart from the field flattener lenses), but at a lower price point. 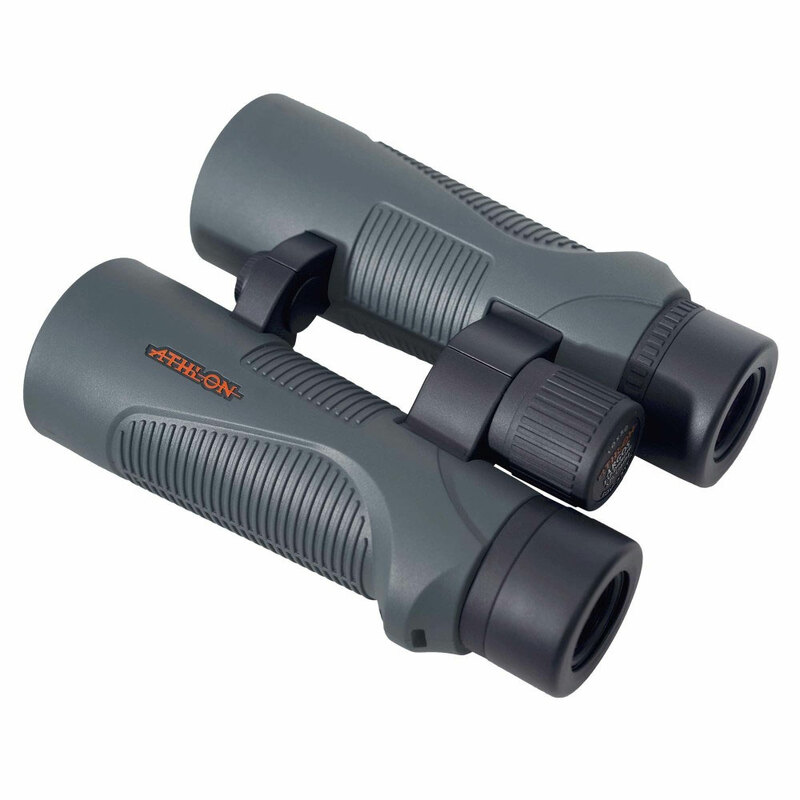 However the Aries also offers a wider field of view which will be of great interest to many users including hunters and birders, but with the trade-off being a slight loss in the amount of eye-relief and close focus distance. Also like the Cronus, these Ares binoculars also have a magnesium chassis, but this time they have opted for an open bridge design, which offers a number of advantages, including weight saving and freeing up more of the barrels to hold onto for a more secure grip. 10x42 341ft 14.7mm 8.2ft 29.8oz 6.7" x 5.2"
8x42 426ft 16.5mm 6.5ft 29.8oz 6.7" x 5.2"
10x36 351ft 13.9mm 8.2ft 24.9oz 6.1" x 4.9"
8x36 405ft 14.9mm 6.5ft 24.9oz 6.1" x 4.9"
The single bridge body has a chassis made from a magnesium alloy that as you would expect is both waterproof and filled with Argon gas to protect inner optics from fogging. The fully multi-coated optical system includes ED glass lens elements, BaK-4 roof prisms with both dielectric coatings and phase correction ones and you get extra protection coatings on outer lens surfaces. Thus as you can see, apart from the body shape, you are getting pretty much the same level of components and features as the Ares, but at a substantially lower price! 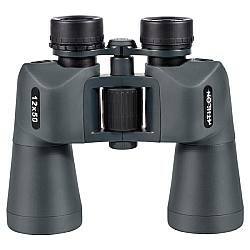 So whilst I think the Ares is good value, these Athlon Midas Binoculars look to me to be EXCELLENT value for money binoculars. 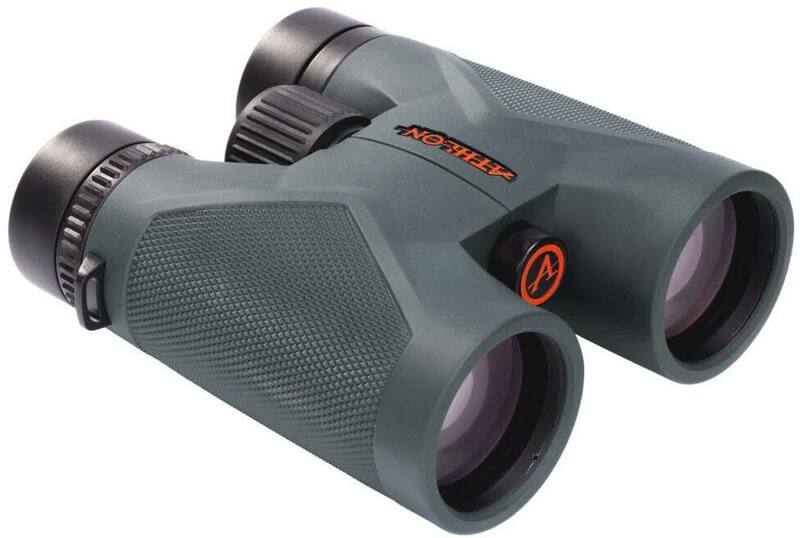 Indeed as you can read about in this article, they are what I believe to be the very Best Athlon Binoculars for the Money. 12x50 281ft 15mm 11.48ft 33oz 6.7"x5.4"
10x50 341ft 16.9mm 9.84 ft 33oz 6.7"x5.4"
10x42 341ft 15.2mm 8.2ft 25oz 5.7"x5.2"
8x42 426ft 17.2mm 6.5ft 245oz 5.7"x5.2"
One of Athlon's mid range options is the Argos series, that still offer a very high level of components and thus a great performance, but at a price point that will appeal to those on a tighter budget. Where these differ from the higher specification models above and where Athlon have been able to make savings in the production costs include the use of what I think is a polycarbonate chassis instead of a magnesium one. Whilst this is cheaper to produce and arguably not quite as robust as magnesium ones, the advantage is that it is more lightweight, so it is not all bad. Athlon Argus binoculars are fully multi-coated, but they do lack the ED glass elements that you find on the Ares and the Cronus. However and rather incredibly, you still get the same phase corrected Bak-4 prisms with their dielectric coatings, which at this price point is rare. 12x50 257ft 16mm 13ft 29.5oz 6.8"x 5.6"
10x50 304ft 17mm 13ft 29.5oz 6.8"x 5.6"
10x42 319ft 16.1mm 13ft 24.6oz 5.7"x5.3"
8x42 371ft 17.3mm 13ft 24.6oz 5.7"x5.3"
10x34 314ft 16mm 13ft 16.3 oz 5.1"x4.9"
8x34 371ft 17.4mm 13ft 16.3 oz 5.1"x4.9"
Fifth in-line in the Athlon Optics stable is the Talos series, which contains six single bridge, roof prism models available in their common size and magnification options. Whilst relatively inexpensive, the level of optics and components used on these is generally in-line with what i would expect to see. 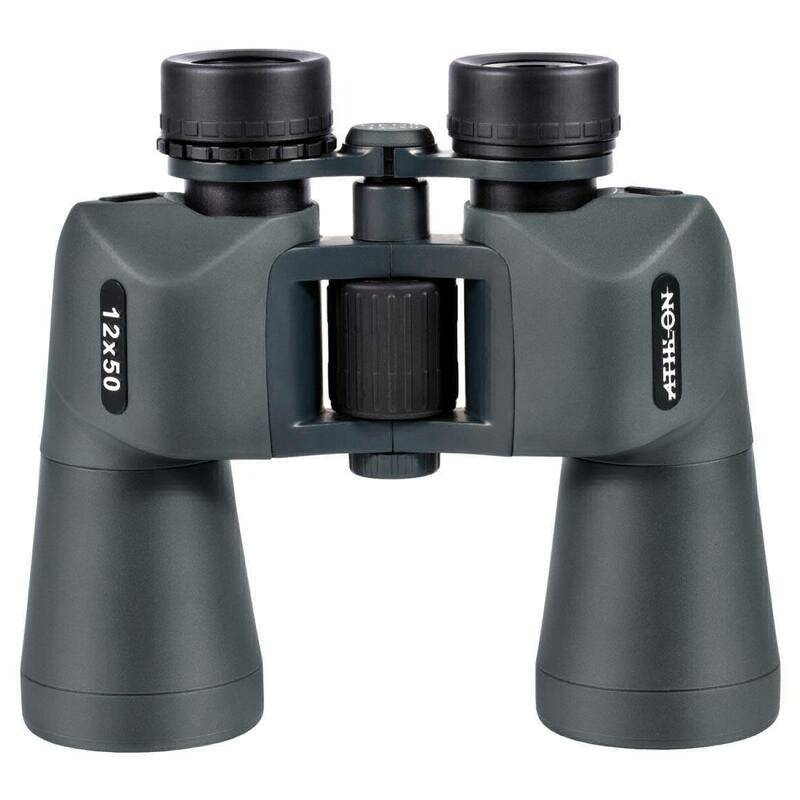 Main features include a fully water and fog proof polycarbonate housing, are tripod adaptable, have twist-up eye-cups, large central focus wheel and a diopter adjustment dial located on the right eye-piece. 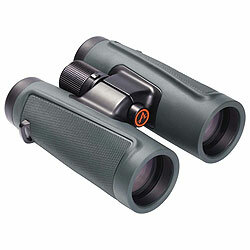 All Athlon Talos binoculars have fully multi-coated optics with bak-4 roof prisms that have been phase corrected. 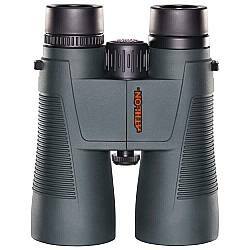 Note however, unlike the more expensive Athlon binoculars above, these do not come with dielectric coatings (they probably use silver but do not specify) nor do they have the extra protective outer lens coatings. At this price this is to be expected. 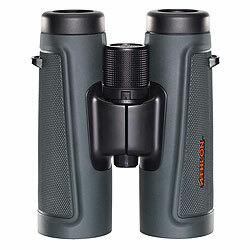 Athlon Talos binoculars come in either 32mm, 42mm or larger 50mm sizes and with either 8x, 10x or 12x variations. In terms of their specifications, they are all fairly ordinary within their particular size and magnification classes. 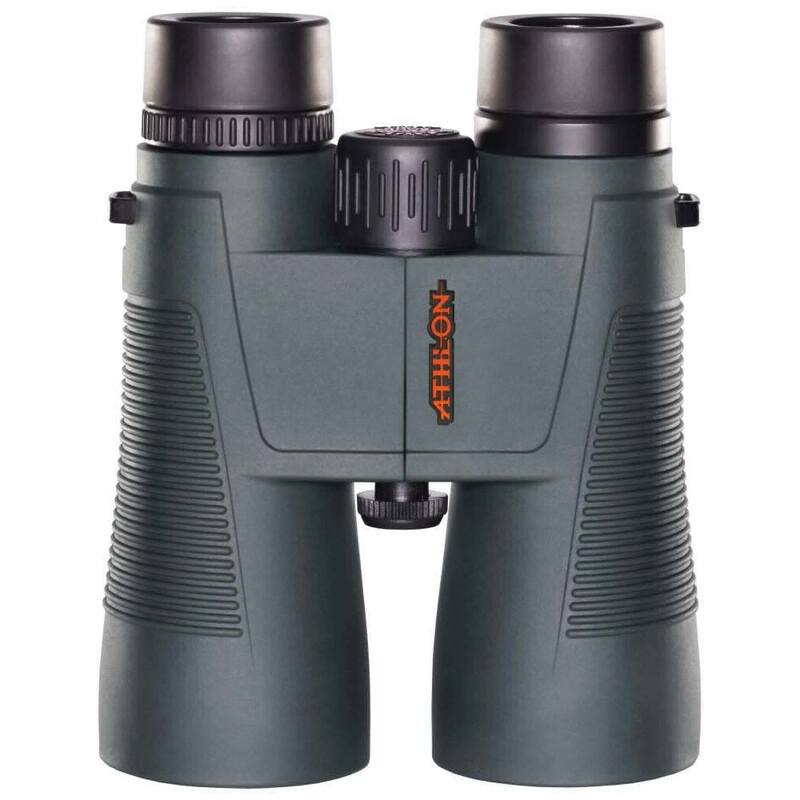 However one model that does stand out is the Athlon Talos 8x32 binoculars that have a particularly wide field of view and so may well be of great interest to wildlife enthusiasts and birders, especially those looking for a small travel friendly binocular. 12x50 242ft 18.2mm 11.48ft 29.8oz 6.7"x 5.2"
10x50 284ft 19.5mm 9.84ft 29.8oz 6.7"x 5.2"
10x42 341ft 15.2mm 8.2ft 25.5oz 5.8"x4.9"
8x42 394ft 17.2mm 6.56ft 25.5oz 5.8"x4.9"
10x32 341ft 14.8mm 9.84ft 19.3oz 4.9"x4.3"
8x32 427t 14.7mm 18.2ft 19.3oz 4.9"x4.3"
Athlon Optics budget range is the Neos which consists of an eclectic mixture of roof and porro prism models in a variety of size and magnification options. In therms of quality, especially when it comes to the optics they understandably cannot match that of their higher end ranges. It is also interesting to note that whilst the roof prism models are only multi-coated, the two Athlon Porro Prism Neos binoculars are fully multi-coated. This means that instead of only the outer lens surfaces being treated, all the optics within the porro prism Neos have anti-reflection coatings added to them. On top of this, because a porro prism does not need any reflective coatings to achieve total reflection you can be sure that these have a good level of light transmittance. The roof prism Neos models use silver mirror coatings on the prisms, which at this price is good. But because they don't have the even better dielectric coatings used on the more expensive Athlon ranges listed above, the porro prism versions will undoubtably transmit more light. Both these factors do make a difference and which is why for my money the Porro prism models are most certainly the better option if you are prepared to carry about a larger device. 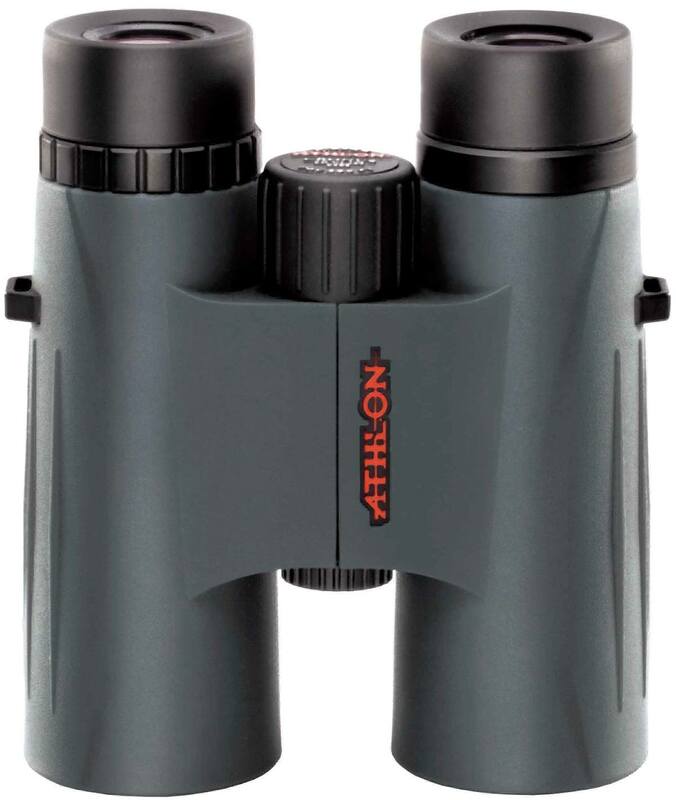 All Athlon Neos binoculars have polycarbonate bodies, are o-ring sealed and thus watertight and filled with nitrogen gas making them fog proof. 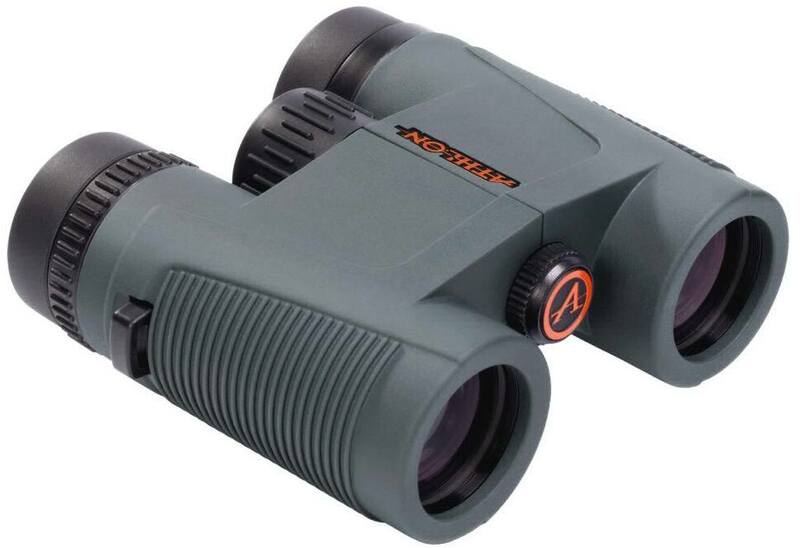 They all have twist-up eyecups which is good as many binoculars at this level, especially porro prism ones will only have folding rubber ones. A diopter adjuster is positioned on the right eye-piece and focus is adjusted on all of the using a centrally located wheel. Not that with the porro prism models, this is positioned within the central bridge, which is fairly standard for this type of instrument. 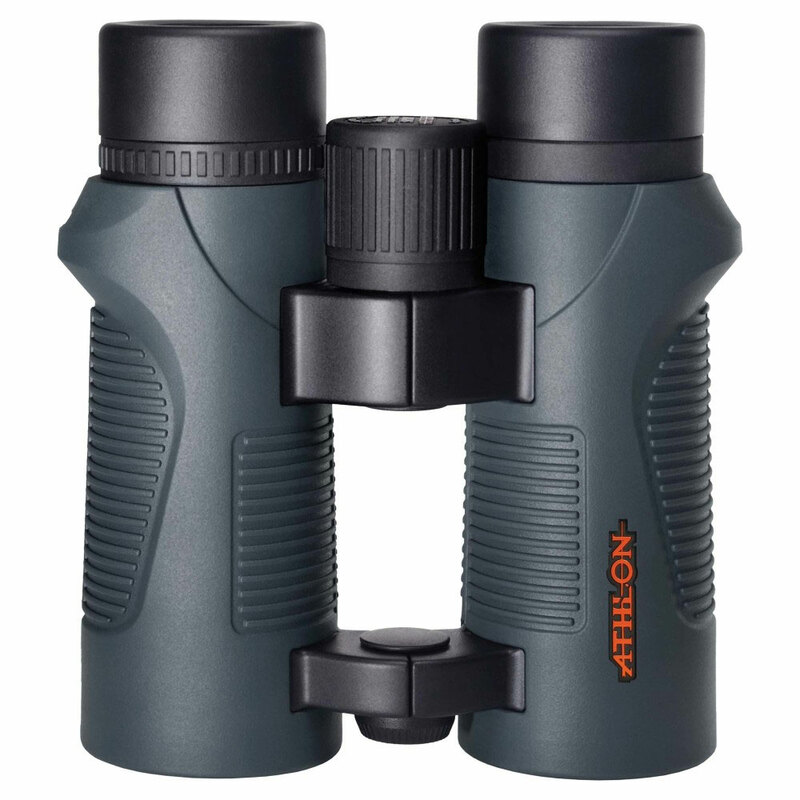 Athlon Neos binoculars are available in usual 42mm models, as well as the mid-sized 32mm models with either 8x or 10x magnifications. The two larger 50mm Neos come in either 10x or the more powerful 12x powers and use porro prisms and which is why they have the more traditional shaped body (see top right). 12x50 294ft 14mm 23ft 33.5oz 6.9"x 7.9"
10x50 342ft 19mm 16.4ft 33.5oz 6.9"x 7.9"
10x42 309ft 14.1mm 13.1ft 24.8oz 5.9"x4.9"
8x42 367ft 17mm 13.1ft 24.8oz 5.9"x4.9"
10x32 341ft 14.8mm 9.84ft 19.4oz 4.9"x4.3"
8x32 393ft 13.6mm 16.4ft 19.4oz 4.9"x4.3"
Below are some featured and fully reviewed Athlon Binoculars: View >> All the Athlon Binoculars that I have reviewed.